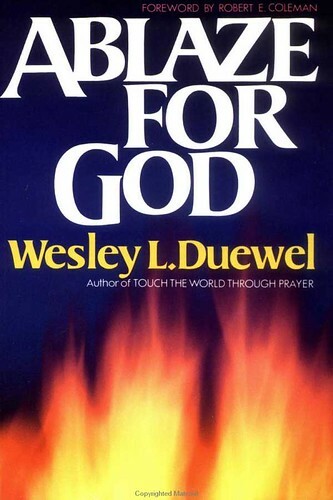 I am currently reading a book called, “Ablaze for God”, authored by Wesley L. Duewel. Only recently have I started reading it and I’m practically glued to it. To tell you honestly, I’m not much of a book person. Really. I mean, I read a few stories compiled in “Chicken Soup for the Soul” and the like… but only to that extent. I seem to have a pretty short attention span when it comes to novels and such. That was then, I guess. Because I’m actually starting to enjoy deep reading and reflecting after every few paragraphs. I notice myself staring into a blank wall or into nothingness just letting the words sink in… letting my whole being absorb the teachings on each chapter. I believe the Holy Spirit has somehow ignited my inner desire to learn more about God. It’s as if I thirst and quench for more teachings… it’s like I thrive in discussions about the Lord. This book is currently the topic of the next two weeks of our KG (Koinonia Group) gatherings. And though we are only supposed to tackle certain chapters from it, it looks like I’ll be going through it from cover to cover. I pray for more of this unquenchable desire to know more about the Lord. I recently wrote a song for one of Viva Record’s new talents. Her name is Mocha. I blogged about this months back when her album was still in mid-production… well, the album is out now and is available in your favorite record bars. The song I composed for her is entitled, “Sige… Paalam Na”, which talks about a person whose been hurt one too many times by someone and ultimately realizes that the relationship he/she’s in isn’t worth saving anymore… and moving on is the only option. A little video we took of my little Isabella playing a little game she invented with her mom called, “Opposite”… The game is simple: Just say something negative to each other and then say, “Opposite”, at the end… hahaha… well, it’s cuter than it sounds… just watch, you see what I mean. LOL! Well, a few months back I posted a remake of their hit single, performed by “Candles”… a band I used to co-manage till they disbanded (creative differences). This particular remake was included in the group’s debut album which came out during the last quarter of 2006 under Viva Records. 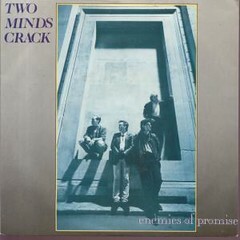 Long before 6CycleMind’s version was ever released. Hahaha… I was particularly amused by his last words (“and at least you got Kev’s words correct!! !”) coz I also found out that Pete is aware of 6CycleMind’s version. And listening closely to their own rendition of the 80s New Wave classic, you’ll notice that there is quite a number of wrong lyrics in it. 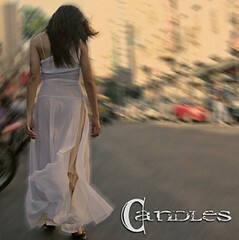 Well, it’s a shame Candles disbanded so early in their careers… but things like these do happen. Oh well… I guess that’s that. I recently stumbled upon an image floating around the net which I haven’t seen in ages! I was pleasantly surprised to discover an image cap of an old old film entitled, “Penoy Balut”. This film featured Nora Aunor, Roderick Paulate, Me and Isabel Granada. Funny thing is… I don’t have a video of this movie… nor can I clearly recall the plot/story of this film anymore. Hahaha! If I remember right, this was filmed way back in 1988… and the location where that image was taken is somewhere along Ortigas (actually Granada St.), one of the houses situated in front of JT’s Manukan. I think. Hay… feeling nostalgic again… LOL! Lotsa memories… good times… fun times. Oh well…! Basically, you get an idea of how the area looks like. 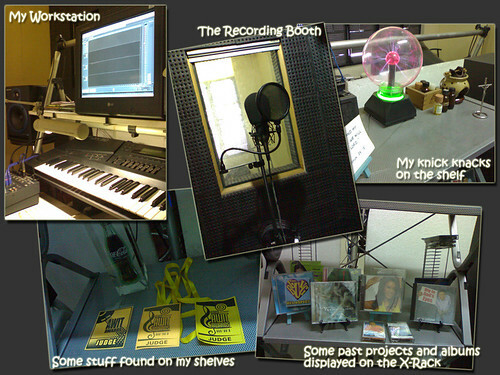 Normally, the workstation has more clutter than it does on the pic… mostly pens, CD-Rs, lyric and chord sheets… stuff like that…! Well, I know I should’ve posted this update a few days earlier but work and chores have prevented me to do so… so, only now am I able to update my blog. I feel kinda bad not being able to update and post articles as often as I want lately but I guess that’s just how it is… for now. 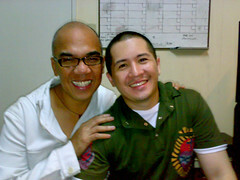 So, last Thursday, Boy Abunda came over to record a few voice overs for a radio ad that’ll be aired probably this week. I am not allowed to mention the product yet but for those thinking that it might be Argentina Corned Beef… it isn’t. My little girl, Isabella, stayed up late knowing that Boy would be coming over… she kept on doing the rounds… coming in and going out of the studio pretending to look busy though she was well aware that it was way past her bedtime. I even noticed her shiny lips when she sat beside me by the workstation. 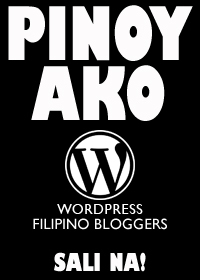 I even asked her, “Huy… gabing-gabi na…! Naka-lipstick ka ba? !” She replied, “Lipgloss!” I answered back, “Eh bakit ka naka-lipgloss pa?”… “Eh, kasi dry ang lips ko kanina pa.”, she said. But actually I felt she wanted to look pretty when our visitor arrived so she wanted to be all made up.